This patio was poured some time ago but has maintained it’s longevity with proper maintenance and a resent reseal. Fall is here and it’s more important than ever to maintain the upkeep on your concrete surface to ensure longevity. Give your concrete surface a good cleaning. Clear off all the summer grim. Get out the pressure washer and with a mild cleaner, rinse off any dirt. Time for some spring cleaning! 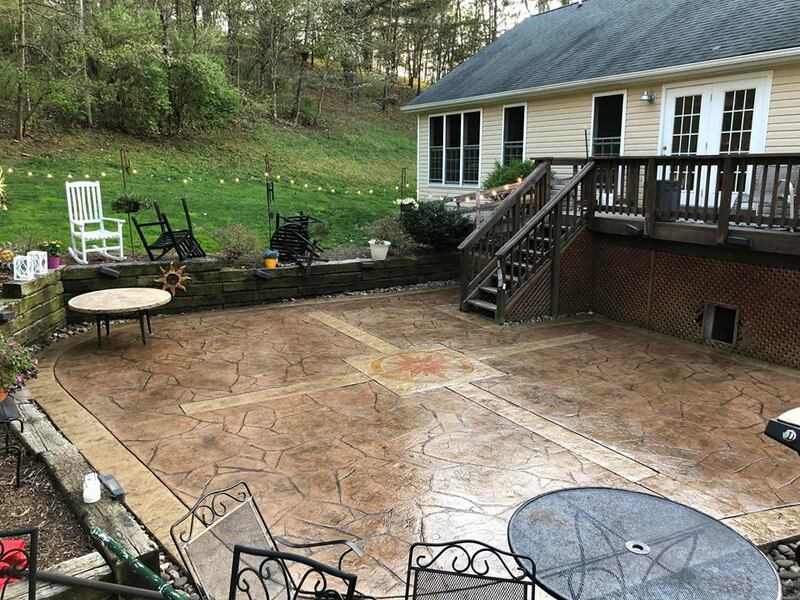 Stamped concrete is durable and can last for a long time when properly cared for.Cleaning your concrete periodically and keeping it sealed with the right concrete sealers are the key components of any good maintenance program. Even professionally sealed stamped concrete will require routine maintenance, depending on conditions and foot-traffic it receives. Below are are tips for cleaning and treating your concrete surface to preserve its beauty and extend its life. Periodic sealing is the best way to protect your concrete from moisture penetration, staining, freeze-thaw conditions, de-icing chemicals, and abrasion. Get on a maintenance plan with us at Blackwater to properly maintain your decorative concrete annually. Our goal is to provide personalized service and distinctive ideas, giving each client and project the full value of our collective experience and knowledge. That’s why we’ve developed a maintenance guide for you, our clients, so that your concrete will look as good as new, many years after installation. Looking forward to spending time outside in your decorative outdoor space? Don’t put off your annual concrete maintenance–you can protect your investment by sealing or resealing those spaces! 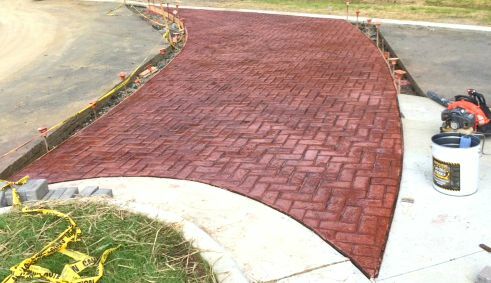 When decorative concrete is initially installed, the majority of contractors will use a sealant as a final step. Unfortunately, most homeowners do not realize that resealing their decorative concrete is needed on an annual basis. Dry surface completely by using a leaf blower or by waiting 24 hours to air dry. DO NOT APPLY SEALER TO A DAMP/WET SURFACE. Apply sealer using a 1″ nap roller. Apply sealer in approximately 2′ x 4′ sections. This will ensure full coverage without missed spots. 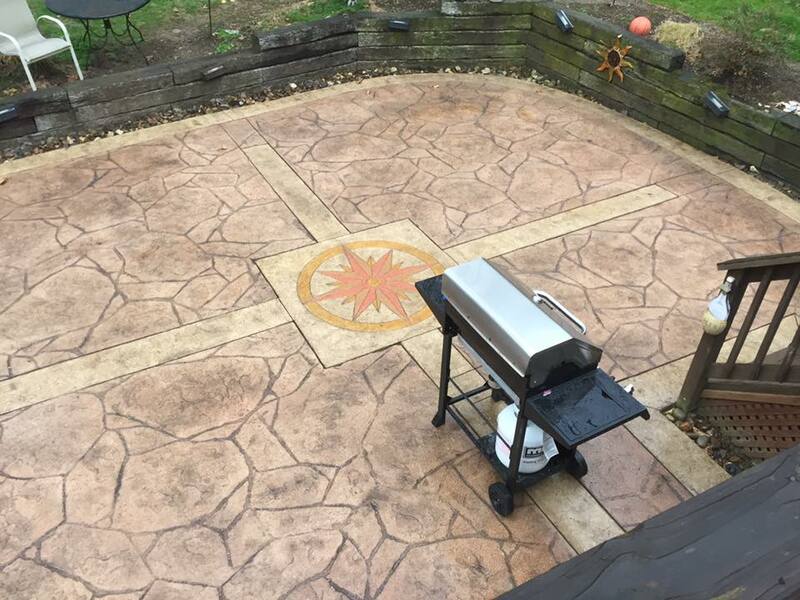 In general, sealer should be applied when air temperature is above 55 F. Best results will be obtained by applying sealer during cooler temperatures — fall and spring — or before 10 am and after 4 pm in summer months when surface temperatures should be under 90 F.
Your stamped concrete should be resealed every year (more or less depending on other variables such as weather, use/traffic, pets, etc.) to protect your investment. One 5-gallon pail of sealer will cover approximately 1,000 square feet. At Blackwater Concrete, our goal is to provide personalized service and distinctive ideas, giving each client and project the full value of our collective experience and knowledge. That’s why we’ve developed a maintenance guide for you, our clients, so that your concrete will look as good as new years after installation. Download the PDF here! Salt and Concrete – Is It Harmful? Concrete is a magnificent, long-lasting material that can be used for almost anything. However, as Tim Carter points out, “its useful life can be significantly reduced if you do not recognize its weaknesses”. Concrete can be weakened when subjected to rock salt. While concrete is a tough and durable material, it can and will absorb water. If you’ve ever been outside on a hot day and spilled water on your sidewalk or driveway, you can actually see the water penetrate the surface of the concrete. When you put out rock salt to melt snow and ice, the salt dissolves the snow and makes a salt water mix that then enters the pores of your concrete. If the temperature then drops and the water freezes, the pressure of growing ice crystals within the concrete can cause spalling (the surface becomes rough and flaky, and begins to pit). On a low level, this can be purely cosmetic, but it can also result in structural damage. The good news? Concrete which is installed and sealed properly can resist years of contact with rock salt. However, maintaining the sealer on a stamped concrete surface is a must. For maximum protection, it is recommended to seal after new concrete has cured and re-seal your stamped concrete every year for existing concrete. 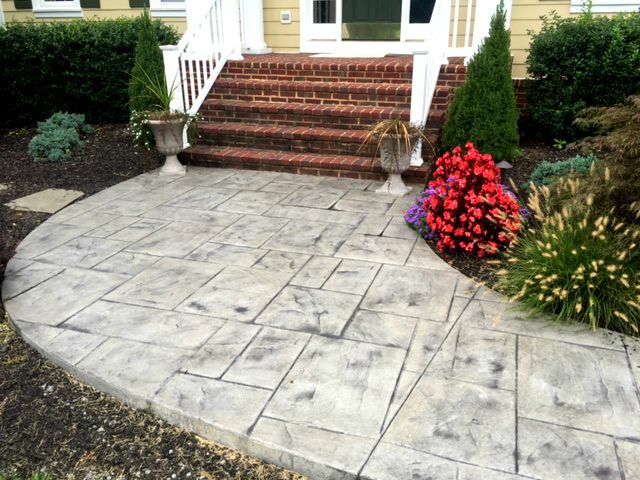 Learn more about sealing stamped concrete here. Looking for an alternative to rock salt? Many experts recommend using sand. While it won’t melt the snow and ice, it will provide you with traction. It’s early September now – where did the summer go? It’s been a very busy year here at BlackWater Concrete, and based on our feedback from our customers, it’s been just as busy a year for you as well. Hopefully, though, it’s not been too busy to enjoy your stamped concrete spaces! However, in typical fashion, some of us have put off doing our annual concrete maintenance and haven’t preserved those spaces by sealing or re-sealing our concrete. BlackWater recommends at least once-a-year maintenance activity and it’s certainly not too late to start your maintenance for this year. 4. DRY surface completely by using a leaf blower or by waiting 24 hours to air dry. DO NOT APPLY SEALER TO A DAMP/WET SURFACE. · Apply sealer using a 1″ nap roller. · Apply sealer in approximately 2′ x 4′ sections. This will ensure full coverage without missed spots. · In general, sealer should be applied when air temperature is above 55 F. Best results will be obtained by applying sealer during cooler temperatures — fall and spring — or before 10 am and after 4 pm in summer months when surface temperatures should be under 90 F.
7. 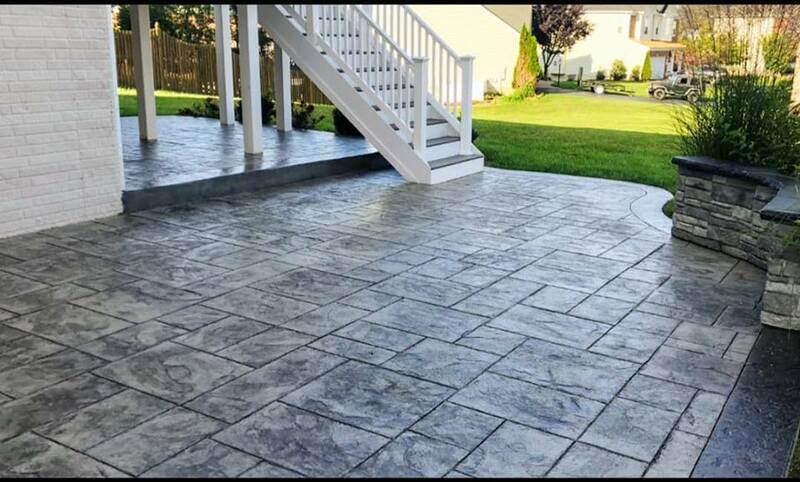 Your stamped concrete should be resealed every year (more or less depending on other variables such as weather, use/traffic, pets, etc.) to protect your investment. One 5-gallon pail of sealer will cover approximately 1,000 square feet. Remember, the finish on your concrete is similar to the finish on your internal floors. It does need maintenance and care to keep it looking fresh and new. 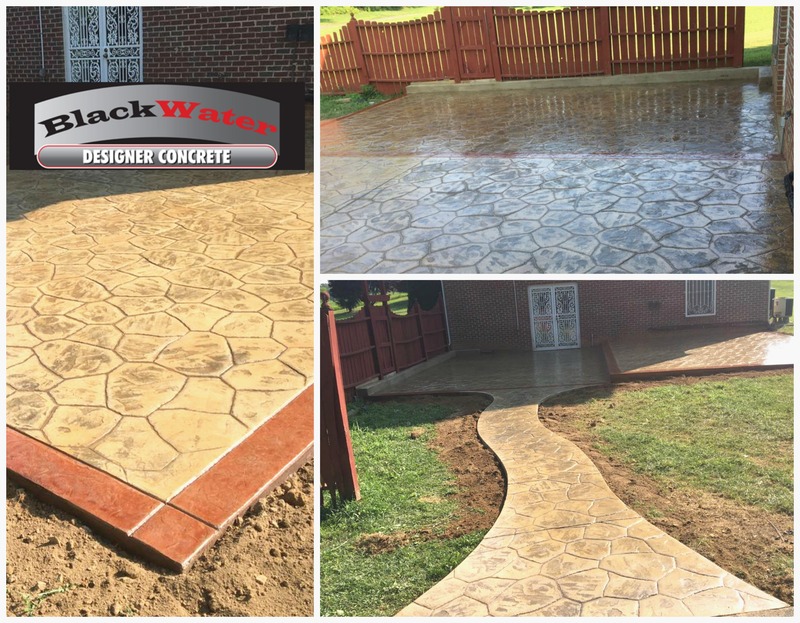 BlackWater recommends Con-crete Werks Sealer, a made-in-America product that we trust with any job (Check them out here). You can order the sealer directly from the site, or have us deliver the sealer to you at a nominal charge. If you want your concrete sealed by professionals, BlackWater offers a sealing service – call us at 540-535-7440 for a quote. In the meantime, enjoy September and your stamped concrete! We’re looking forward to wonderful remainder of 2015!